Hmmm yes maybe too far!You must be nearing driving age though? If not then maybe it IS time for a buggy!? lounge place just like RCU has, why didn i think of that. Buggies are definatly the toughest rc's money can buy and are alot of fun. I use to want a buggy until truggies hit the scene, i still may get one one day though. Sold some tmaxx parts and just cut a deal on selling my Jammin also. . Would liek to get the kyosho running but idk about that yet. just want to save some money right now. For me my buggys are the best rc fun i've had,they're just so tough...i know the truggy will tackle rougher ground but for me the buggy is adequate! Why are you saving Vortex...motorbike? Ah thought you must be that age..you not at college or anything then...silly question,your online more than me!!! No ideas what you want to do? These are on a �1000 car by the way! Hey i should of guessed you'd be doing computers!Is it a specific subject area you'll be studying? Just a general course for IT practitioners. If I chose to study this at uni then you can move into more specalist areas. 17, living in london, unemployed, had the licence for less than one year (didn't even tell them that I didn't have one) with 0 years no claims on a turbo diesel! 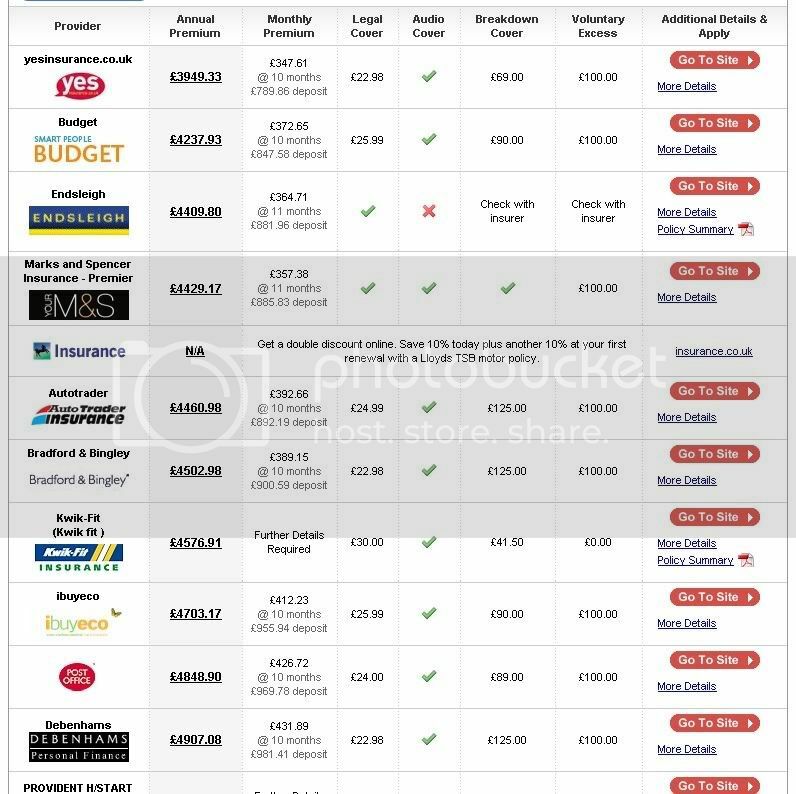 Yes your stats are not too good!To say the least but you've got to start somewhere....no good going on parents insurance...you need to build up your own ncb.Whatare those quotes for...fully comp?Just go third party only for your first car...and buy a car cheap...but don't crash!!! That was 3rd party! On fully comp the best deal is lower strangely, but not by much. The highest one is �9700! Hey "third party only"...not third party fire and theft! Well for one thing i have this 30,000 payment i have to make after i get out of school in 2 years an also looking at buying a nice used car, or just stick with the car i have now. The bike will have to come later becuase insurance will be sky high and dont want to pay in full right now becuase its nearly half of the money i could use for school, and dont want to put a down payment on one becuase i dont want to get tied down with monthly payments. Want to keep things simple with nearly no bills to pay for as long as i can. This is the main reason im getting out of rc for now becuase i shouldn be wasting money on it at the moment. Right now im looking at getting a nice used cadillac, lincoln, bmw, mercedes, or jaguar. i like those big luxury sedans. I would go with a sports car but insurance would be to the roof on those too. Well out of the brands you've mentioned there...in my personal experince...i would only choose the BMW or Merc.! Tell me what models your looking at and what year and i'll tell you why!I've not any experience with Cadillacs or Lincolns but the Jag is a definate no-no compared to the German cars! Why do you want a big car?Do you travel long distance or carry many people? As for what BWM models i like the big ones like the M5 and the 740-760. Was looking at a few 740's i seen for good prices but probably will go with something else. As for Benz, any of the bigger model cars is good for me. I like the big cars over the small cars, cant see myself in a little honda or something, but in a nice cadillac with a V8 in it. Thats another thing, I like the bigblock engines as i like the bigblock engines in rc. Dont want nothing smaller than a V8. I would settle for a V6 but looking for a V8 over it first. I dont have my license yet but i do have a 94 Cadillac deville. But I might go and get something different soon. Now i know (for some reason) Americans like the XJ6...but please...in my experience it's like driving a boat...and not a fast one at that...very spongey ride (want to say wallowey?) electrics are poor and economy...plus that "j" gate box. Have a look at 3 series BMW's...E36-325...E46-325/330....the 330D will not dissapoint for performance or economy! Mercs-look at E and S class...best motors either diesel or the v8's...don't go for a kompressor. ...still not sure why you want a big car!!? i cant really explain why i like the big cars, also like the big SUV's and pickups like the Dodge hemi f150 and the Caddillac escalade ext, but of coarse i cant afford those right now. Thanks for the heads up on the jaguars, cant be happy with a car with that kind of characteristics and performance. I looked at a lot of nice cars. And another thing, they have to be rwd or 4wd, dont liek fwd cars either. Thats one reason i dont like the cadillac i have becuase its fwd.. buts still a nice car for to have for now.